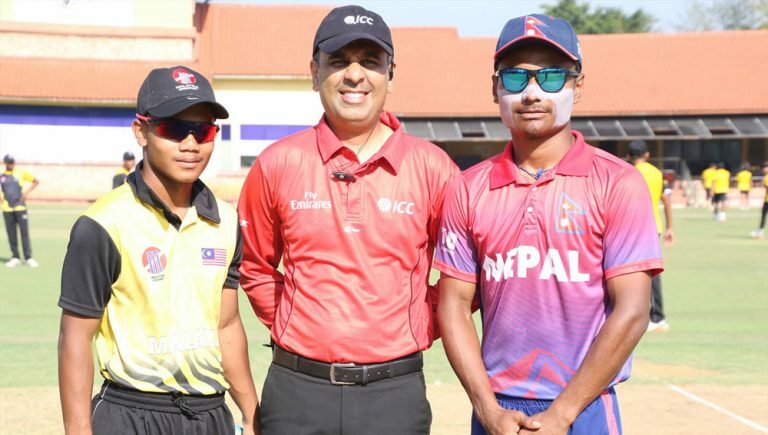 KATHMADU, April 15: Nepal thumped Malaysia by eight runs in the ongoing ICC Asia U-19 World Cup Qualifier at the Bayuemas Oval cricket ground in Malaysia on Monday. Malaysia, sent to bat first after losing the toss, posted a 93-run target to Nepal. In response, Nepal attained the target in just 13 overs at the loss of two wickets. Opener Rit Gurung (not out) hit 39 runs off 45 deliveries for Nepal. He hit five boundaries. Similarly, Asif Shekh scored 26 runs and Pawan Sarraf hit 19 runs while skipper Rohit Poudel was unbeaten in six runs. Malaysian players Shafiq Syakir and Sukri Madeli each took one wicket. Earlier, Malaysia was limited to 92 runs in 33.5 overs losing all wickets. Jelad Daniel bin Ahamed scored the highest run for Malaysia hitting 37 runs while captain Mohamad Amir made 13 runs and Hakim Harisan 10 runs. Pawan Sarraf and Kushal Malla of Nepal each took three wickets while Kamal Singh Airee took two wickets. Nepal will face Oman in its fourth match on Tuesday and Kuwait on Thursday. The winner of this qualifier will get entry to the World Cup to be held in South Africa in 2020.